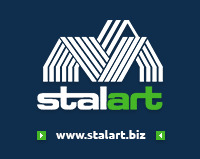 STALART SCS skeleton structures enable large variability of use when building law-energy detached houses or terrace houses, semi-detached houses or superstructures of buildings. The projects of construction are made by special software. According to customer´s requirements or a dimensioned layout plan, a 3D structure is created. After calculation of statics, optimization and correction, a final production and construction project for assembly is created. Consequently, the project of skeleton is transferred into the production line which produces each profile including bending, angled grooves, service holes and compresses for rivets. Each profile of the Stalart SCS skeleton has its position set in advance, therefore, it is not possible to remove, change or damage it from the place of destination within the construction. In the world market, there are many kinds of light steel structures in a variety of quality of the used material and in various formats of the profiles. Generally, the structural stability is fixed even on other construction materials, especially on required parameters of decking boards. In case of our offer, the static is solved directly in the skeleton of the building and the parameters of the decking board and other construction elements are not strictly determined. Therefore, they are possible to be chosen according to designer´s projects or availability of the materials for an investor. In Europe, the determining parameters for selection of the decking boards are their thermal insulating attributes. To illustrate the use of skeletons of the light steel structures in the world, we recommend to see photoes of constructions – examples on the internet using the keywords " light steel frame ", " light steel frame construction ".